What to put in your flight bag and how to organize it is a topic I’ve never really covered in depth during training. I just tell students ‘you need this’, ‘you might want this’, ‘you need a way to organize it’ and move on. However, I have changed what I carry and how in the last few years, based upon my flight instructing experience. 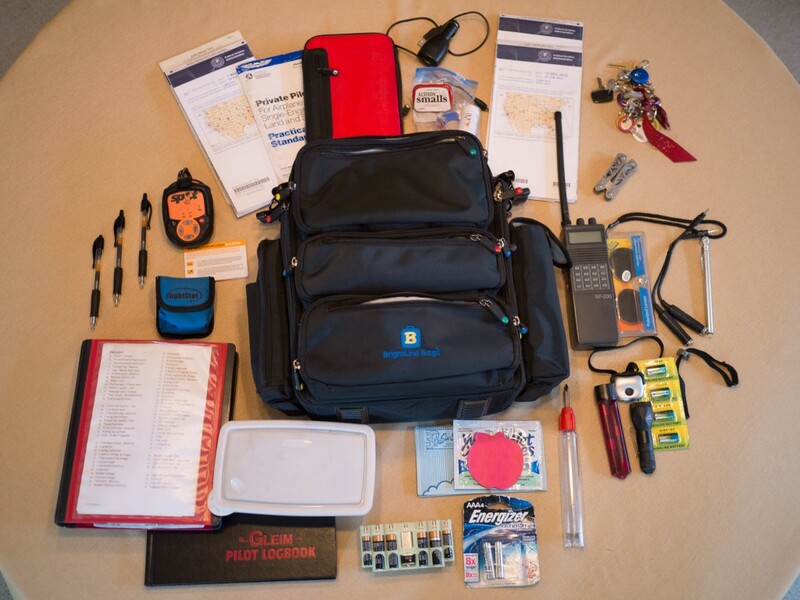 As a flight instructor, I carry more than most pilots need to carry, but some of the items may be of interest and trigger you to evaluate what you carry. I am amazed to see that students and other pilots are often carrying more stuff (at least by volume and weight). 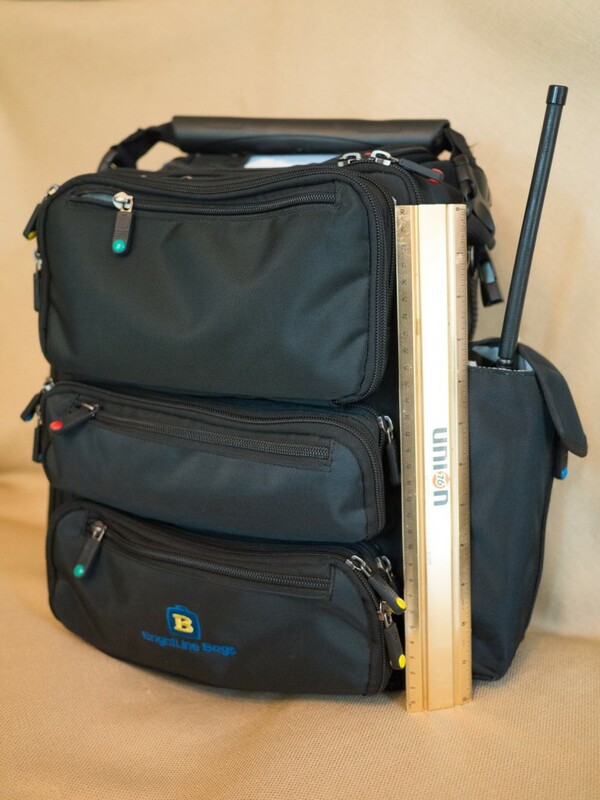 I now carry a Brightline Bag (the version shown in this picture was the B6, but I’ve since replaced with a B4 swift after several years – very similar). They aren’t cheap, but I like the size and organization and so far it seems durable. Lastly, I usually carry my Panasonic GF5 camera and two lenses to increase the chance of getting good shots that aren’t possible with my phone’s camera and which I found didn’t work well with my point and shoot camera. If you enjoy my pictures recently on WingsByWerntz and Facebook, this is what I use for most of them. Logbook – the Gleim logbook is my favorite. It has the columns I need, space to write more than a word in the notes and is the best at being up-to-date on endorsement wording. I tape a business card inside it and also attach a small envelope where I keep my medical and pilot/instructor certificates. VFR Charts – I always carry current paper LAX TAC and Sectional charts easily accesible in an outside pocket and have ready access to SAN TAC and SFO Sectional in an inside pocket. Drugs – bonine, aspirin, and sudafed. For passengers. Multitool – this is a Leatherman knockoff from Home Depot with screwdrivers, pliers, and a few knife blades. Handheld radio – I consider this a necessity for supervised solo flights, but is useful as a backup or just listening to chatter on the ground. This is an older Sporty’s model. I also carry a cable that would allow me to connect my headset. Trying to use this in a cockpit without the adapter would be challenging. The range is limited compared to panel mount radios, so don’t expect to be able to talk to SoCal or Center over long distances. Tire pressure tester – how do you know otherwise? Fuel tester – I like having an extra even if there’s one in the plane. I prefer the type with a reversible screwdriver bit and a removable sampling pin. Sticky notes – I keep a few in the notebook and dozens in my bag. These are the extra sticky Post-Its in the shape of an apple and work well for covering instruments for partial panel/failures. The majority of my flight is done inside of the LA Basin on training flights. It would be difficult to “disappear” in the LA basin, so I put most of my more survival oriented gear in a separate bag that I take with me for longer flights. This is very helpful, and I always get a great deal of pleasure contemplating a packing list! I have a question: why BOTH airsick and barf bags? Aren’t they the same? I just used both common terms in different places – same thing!